On a wormy ridge of mountains running north to south between Chewelah and the Columbia River, a cluster of radio towers broadcasts from 5,800 feet above sea level. Stensgar Mountain, as it’s called, is no good for human habitation — the spiny crest is impenetrable with snow and ice by November most years. But when it comes to radio waves, the mountain is a perfect location. The waves from the towers wash over five counties and all the major population centers. They reach the Spokane, Colville and Kalispel reservations. And they hit the ears of as many people as possible in this pockmarked and gently sloping scabland landscape that we call home. And now KYRS Thin Air Community Radio, Spokane’s lowpower FM station, is headed to the top of that mountain owned by the U.S. Department of Natural Resources — right up there with the new, 120-foot tower erected by the U.S Department of Homeland Security. “It’s some massive thing,” says Lupito Flores, the station manager at KYRS, of the Homeland Security tower. “So they’ll keep a good eye on us,” adds Angela Johnson, the station’s program director. Next November, on a knoll separate from the rest of the towers, the transmissions should begin and KYRS will have joined the big leagues. The station will have a new 75-foot tower, a new beefed-up transmitter, antennas and — most important — status as a full-power station (making the ascent from 100 to 6,500 watts) on 88.1 FM. With the Federal Communications Commission permit in hand allowing the move, and a came-in-the-mail-last-month $188,000 grant from the U.S. Department of Commerce’s National Telecommunications and Information Administration in the bank, the little station will double its coverage area and reach more than 200,000 new listeners — 24,000 of whom currently don’t have any access to commercialfree radio. The FCC was protecting the little guy. Sounds nice, but Flores says that wasn’t the case. 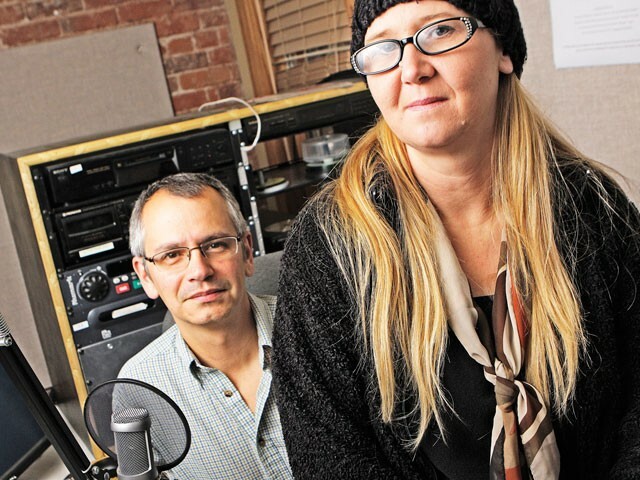 Three years after low-power FM was created and $40,000 later, a “barn raising” was held (with the help of the Prometheus Radio Project) and KYRS was born. But Flores was right. The station couldn’t operate with more than 100 watts (the power of a light bulb) and had virtually no say compared to that of full-power stations. Detention (for younger people), Make Gov Work (a wonky government show) and Call on YAHWEH (a reggae show, of course). There are shows aimed at “workers” and Spanish-language programs. There’s a show devoted to exploring conspiracy theories and another to discuss women’s studies. There is a poetry show, a gospel show, a Persian show, an environmental show. There’s a fiveminute chunk of local news every weekday morning. The station also picks up nationally produced shows like Pacifica Radio Network’s Democracy Now and Free Speech Radio News. It’s the kind of radio heard in big cities where the multitudes jostle to be heard — or hear something they can actually relate to. But, unlike many big cities, KYRS is also trying to serve a population particular to the Inland Northwest: the tribes. Many of the 24,000 people whom KYRS will reach live on Spokane’s neighboring reservations and currently receive only commercial radio. For them, KYRS offers InnerTribal Beat, a weekly two-hour show featuring Native American news, music and commentary. A majority of the show’s content, however, is generated by call-in listeners. Ferguson says the point of the show is to “bridge the gap between Natives and non-Natives, rural and urban Natives and the youth and the elders,” but the overriding goal is to be a major, independent source for regional Native news. Things are looking rosy for KYRS right now, but there’s still work to do. The almost $200,000 from the feds will go a long way, but Flores estimates that the station needs to raise another $300,000 to make it fully operational (that’s counting the $69,000 in matching funds it has to raise for the grant money). Johnson says she needs to build up more tribal programming, and maybe some more original news content. Regardless, things are good. But the station’s been through enough for its staffers and many volunteers to revel in it. In 2006, the Sandpoint-based and full-powered KPND was given permission to build a stronger broadcast facility closer to Spokane. This encroachment, as it’s called, threatened KYRS because at the time, the two stations shared the same place on the dial, 95.3 — not a problem when the two were so distant, but disastrous as KPND moved in. “Low-powered FM is a secondary service, which means any primary service — such as a commercial service or a public radio station — can come in to where a community station is and pretty much tell them to go away if they want that frequency, or one that’s close to it,” Flores says. The station’s stayed on the same frequency since then, but always with the threat of encroachment looming. When service starts at 88.1, no other broadcaster will have the power to bump the newly full-powered station.